Collection is an object representing a group of objects. Collection framework contains a set of classes and interfaces which are used for representing and manipulating collections. 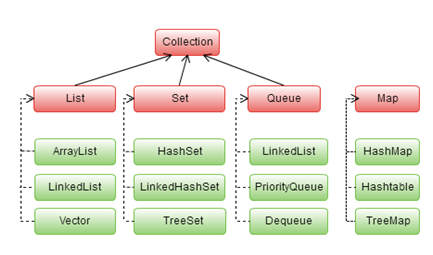 Collection interface is the root interface from which the interfaces List, Set,Queue are extended. List interface is an ordered collection in which duplicate elements are also allowed. Elements are stored in a sequential way and hence its elements can be accessed using the index value. Set is an unordered collection. It does not maintain any order while storing the elements. It does not allow duplicate elements. Thus if one requires to store a group of unique elements, set can be used. Map is an interface which maps keys to values in which each key has to be unique. Iterator interface is used to iterate over a collection object and retrieve the elements one after the other. ListIterator is similar to Iterator interface except that the elements of the collection can be retrieved from both forward and backward direction. Enumeration interface is similar to Iterator interface except that it cannot remove elements and can only iterate over the collection object. Enhanced for loop can also be used to iterate over the collection object.